Want to find out how long it will take to save for your house deposit? Use this House Deposit Calculator calculate the deposit amount and find out how much you need to save a month or how long to save for! Just enter some information about your house deposit, then either the amount you are saving per month or the length of time you want to save for, then click calculate! Thinking about using Help To Buy? Try our Help To Buy Affordability Calculator. Using our House Deposit Calculator is simple and allows you to not only figure out the deposit required for your purchase, but also lets you calculate how long you will need to save for or how much you need to save a month to get your deposit together in a period of time. Enter the deposit amount, or enter the value of the property and select the percentage deposit required. 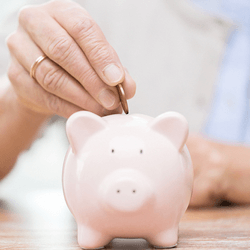 Enter the annual savings interest rate of your savings account. Enter the amount you will be putting into this account every month - our calculator will tell you how long you will need to keep paying in to get the full deposit amount. Enter the number of months in which you want to have your deposit saved - the calculator will tell you how much you will need to pay into the account to have the full deposit available in that time period!